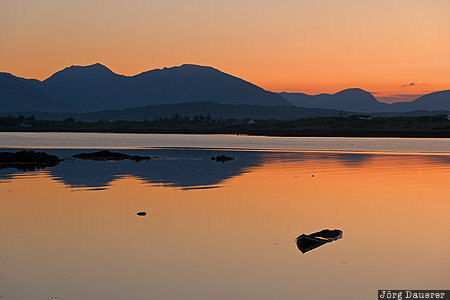 A colorful sunrise behind the mountains of Connemara and the wreck of a small sunken boat in the calm Atlantic Ocean seen from Roundstone. Roundstone in Connemara, County Galway in the west of the Republic of Ireland. This photo was taken in the morning of a sunny day in May of 2016. This photo was taken with a digital camera.